Recently I was asked what I believe in (as in really believe in), and I was struck mute. But put God and all those tricky questions aside temporarily and I have no problem providing at least one answer: I believe in strange, unexplained coincidences that hint at a level of interconnectedness between us all that we have yet to discover or understand. These little coincidences happen to me from time to time. A friend will pop into my thoughts; a minute later, the phone rings, and it is that friend on the other line. Or I’ll think of someone, and this cloud of a feeling much vaguer than concern will float over me, but it will leave me with an impetus to give them a call. I do, and sure enough, something big is happening in their life. Twice I’ve dreamed that a friend was pregnant. Both times, she was. When my husband was summiting Mt. Kilimanjaro, I had an overwhelmingly intense headache one night, which was noteworthy because I normally don’t get headaches. Later we realized that evening spanned the same time period when he was experiencing a skull-splitting pain due to altitude sickness. Why these connections occur is beyond my understanding, but I’ve experienced them enough to believe they’re real—more than just mere coincidences explained away by the randomness of life. My husband and mother like to talk after dinner some nights of Stephen Hawking’s idea that we are actually surrounded by several undiscovered and unseen dimensions. We live in a three-dimensional world of space, and then there’s that pesky passing of time we can’t escape. (Together they explain the four known dimensions.) But he and other physicists posit that there are seven more dimensions that go unnoticed. So I wonder, perhaps these unseen connections I experience occur through a fifth, as-yet-undiscovered dimension. Maybe one day some scientist somewhere will discover this dimension, and then all these weird occurrences will suddenly make sense. Sometimes the connection I feel has less to do with a certain piece of knowledge, and more to do with a general feeling of camaraderie between me and another person I’ve never met. I will see a person’s art or creation and feel that they are a kindred spirit, that we share something. I imagine most people feel this from time to time. This happened to me recently with a book I found at Half Price Books, Paris along the Seine, by Gerald Geerlings. I was initially drawn to it because a) I love Paris, and b) the book is filled with detailed sketches of Paris, you guessed it, along the Seine River, which is my favorite part of Paris. After I brought the book home, I realized a signed print of one of his sketches was tucked in the back of the book. What a treasure! My husband and I will soon embark on a trip to Europe, and one of the stops will be Paris. I’m planning on taking this book with us; perhaps we can use it as a guide of sorts. 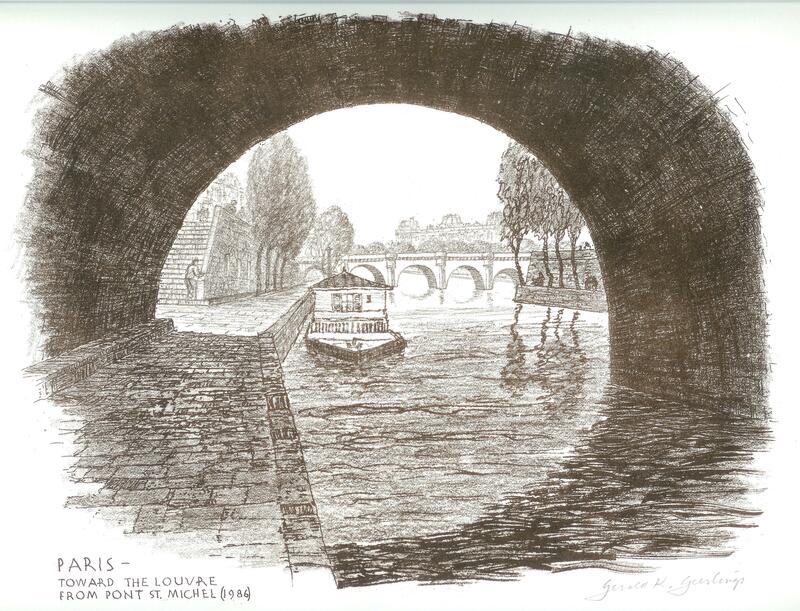 The sketch on the signed print is of a spot along the Seine mere blocks from our hotel—I think a photo is in order! In anticipation of the trip, I have been reading a bit about Mr. Geerlings’ life. What an inspiring man. He was born in 1897 in Milwaukee, Wisconsin, which is where my parents met and fell in love while attending college. He fought in both World Wars. He was stationed in Paris during the First World War, and in the Second he traveled to Italy and Japan. Back at home, his interests led him in many directions, laying the basis for a wide and varied career as an architect and artist. The breadth of his life was united by his deep love of his wife of 62 years. When Mr. Geerlings was 74 (! ), he and his wife spent the next four years in Paris working on the sketches in this book. Mr. Geerlings did the drawing, but the book says that his wife was a huge support and inspiration, helping him research the current work chronicling this stretch of the Seine. The years were 1971-1975. My husband and I were born during those years. I’m not saying he’s my grandfather in a parallel universe or anything; I’m just saying it’s kind of funny. If I could write my dream eulogy, summing up the accomplishments I had achieved in my life, it would go something like that. Well, except for the decorated soldier part. (Although if life required me to become a soldier, a little decoration would help soften the blow.) Take out the soldier bit, drop in “loving mother and wife,” and maybe switch out a few nouns here and there, and my scattered ashes would collectively glow with pride. I love the variety and depth of his interests, and his overreaching appreciation for beauty. Throughout my life, I’ve kept journals. Not for writing in, ironically, but more for idea generation in many forms. Once, as a girl, I wrote the words “RENAISSANCE WOMAN” diagonally across the page of one of my journals. Then I filled the space around these words with all the jobs, roles, and interests I wanted to pursue in my life. I had just learned about Leonardo da Vinci and his diverse works and talents. As soon as I heard him referred to as a renaissance man, I knew that’s what I wanted to be when I grew up: a renaissance woman. I wish I still had that page from my journal. What did my young self aspire to become? I don’t remember the particulars, but I know love and beauty have been two ideals I’ve always held high. For the first time in my life, I feel like I’m pursuing my true heart’s desire. (My apologies if that just overloaded your corn-o-meter.) The odds are that I will never become a famous writer or artist, but if I am lucky enough to be allowed to continue spending my days loving my family and those around me, and creating beauty in many forms, I will die a happy woman. I’m at a coffee shop, so the only glass I’m raising is a long cold chai latte, but no matter. Here’s to Gerald Geerlings—his love of beauty, Paris, and his wife of 62 years. And here’s to all of us living out our childhood dreams. Yea, string theory is pretty ridiculous. The two second version of it is that everything is attached by unseen strings. Your post reminded me of it for some reason. Seeing people attached by unseen strings. I love this post Amy. Deeply, truly, madly. I’m raising a virtual glass in honor of your twin pursuits. I must have been at the same time in Paris while he was painting….. Really?! Are you any relation that you know of? How interesting! It’s a great book; I have it on display on a shelf in my living room. Thanks for stopping by!